There are few images that conjure up the late 1960s like a paisley pattern in hot pink. It may seem strange that Fender opted to apply such an unconventional look to its traditionally functional Telecaster guitar rather than to its decidedly hipper Stratocaster model, but the flat shape of the "Tele" actually lent itself much better to this surface treatment. 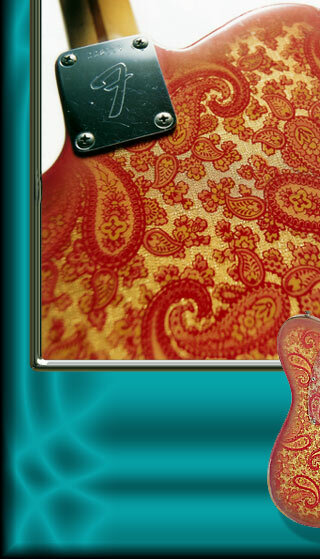 To achieve it, Fender simply purchased an adhesive-backed foil wallpaper printed with the paisley pattern (along with one in a foppish blue "flower power" design) from the Borden Chemical Company of Columbus, Ohio. Both of these psychedelic fashion statements were dropped about a year after their first appearance in 1968, as the fad for paisleys and big flowers died out faster than Nehru jackets and love beads. Strangely enough, the one noted guitarist who played a Pink Paisley Telecaster was James Burton, one of Elvis Presley's band members. Burton was initially concerned about what Presley might think of this odd-looking guitar, but he claims that the King loved it. and ten minutes if I wanted to smash it up. Oh it breaks my heart to see those stars smashing a perfectly good guitar.